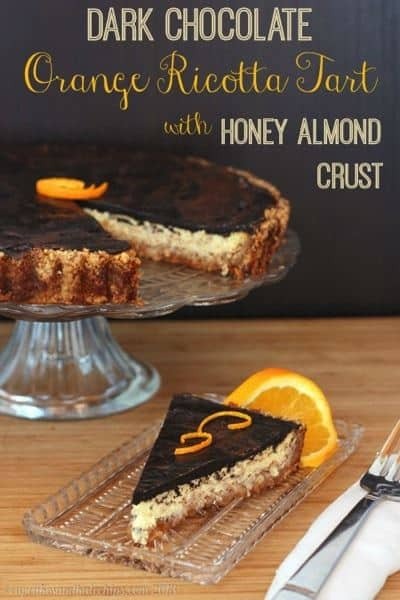 A sweet and nutty crust with a citrusy ricotta custard filling, topped with a slightly firm dark chocolate shell, so rich and elegant that there is no reason to reveal that it is an all-natural, healthy indulgence, completely grain-free, with no refined sugars. 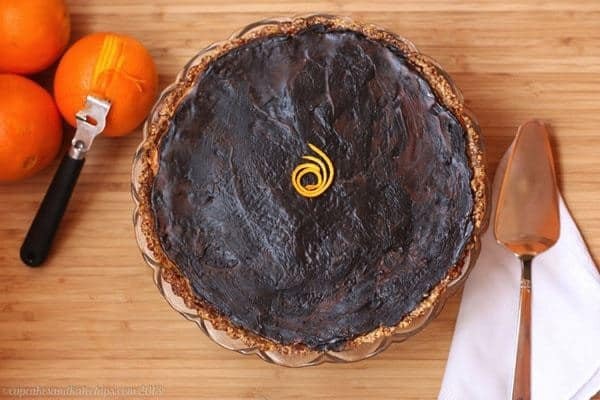 Dark Chocolate Orange Ricotta Tart with Honey Almond Crust is so rich and elegant that there is no reason to reveal that it is a natural, healthier indulgence, completely grain-free, with no refined sugars. 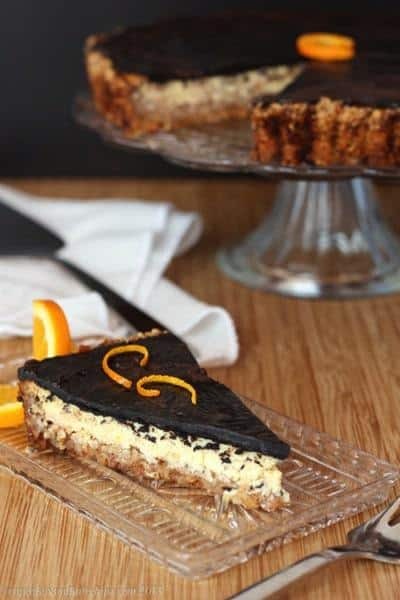 The crust is sweet and nutty, with a citrusy ricotta custard filling, topped with a slightly firm dark chocolate shell. Can you believe we have reached the end of #ChristmasWeek? I started the week with something totally decadent, over-the-top, and fun for the kiddies, with the Flourless Peanut Butter & Nutella S’Mores Sandwich Cookies. Next up, something a bit more elegant, but still an indulgent little bite that you can easily serve at a cookie exchange or casual get-together: Flourless Nutella Marshmallow Cookie Cups. Then, to help balance the sugar with a little fiber and protein, are flourless, eggless, secret ingredient Chocolate Peanut Butter Cup Cookie Dough Truffles, that are perfect to wrap up as gifts. Elegance and refinement both in the presentation and the flavor profile, but still not difficult to make. It took awhile for me to get on the chocolate and orange bandwagon, but now I am totally in love with the combination. And there is just something so fancy-shmancy about it. I mean, even a simple yogurt parfait looks like it is ready for a glamour shot with these ingredients. I almost hesitate to tell you that since there is no flour, it really can be enjoyed almost guilt-free. Plus, it’s grain-free, and has no refined sugars. I know that freaks some people out, but seriously, don’t let it. I mean, you’ve got rich ricotta lightened up with fresh and citrusy orange, nutty almonds for crunch, and the intense, subtle bitterness dark chocolate balanced by a robust but not overpowering sweetness from honey. This is real food, people. 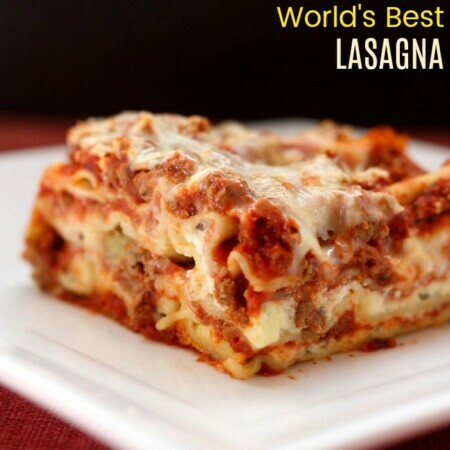 Real, amazing, flavorful, delicious food. And I totally think eating real food HAS to include dessert! 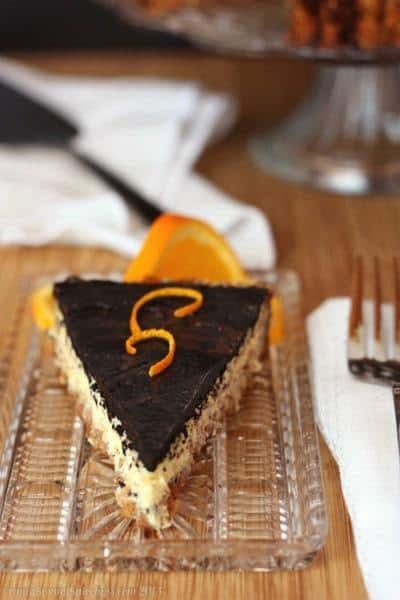 This Dark Chocolate Orange Ricotta Tart would be a perfect final course for a dinner party, or would look gorgeous out on a dessert table for a cocktail party or open house gathering. And while it may still be part of Christmas Week, couldn’t you see this as a conclusion to a fancy New Year’s Eve meal? Not only does it taste amazing, but as you can tell by all of the photos and the way I am swooning over it, I just can’t get over how gorgeous it is. I think, perhaps, one of my best models this year. Don’t you agree? Hot chocolate and marshmallows, peppermint and mocha, chocolate and orange, or something else – do you have a favorite holiday-ish flavor combination? 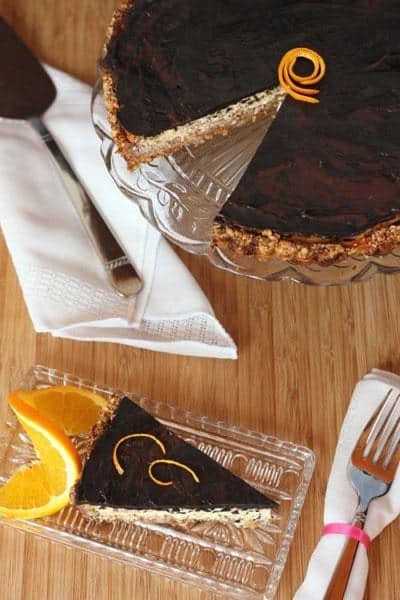 Enjoy this dark chocolate orange, deliciously decadent tart! Whisk the almond meal and salt together, and add the coconut oil or butter and honey. Stir together until well combined. 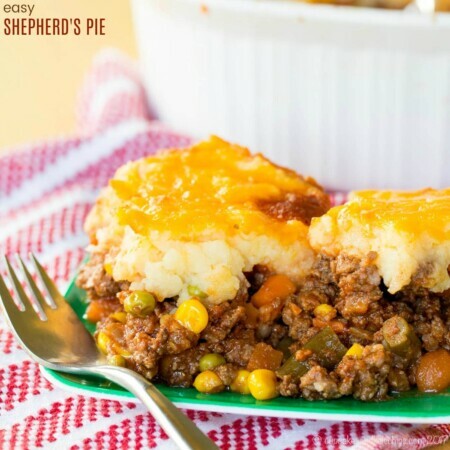 Press the crumbs into a 9-inch tart pan, working the mixture up the sides. Bake for 10 minutes or until lightly golden, and set on a rack to cool. 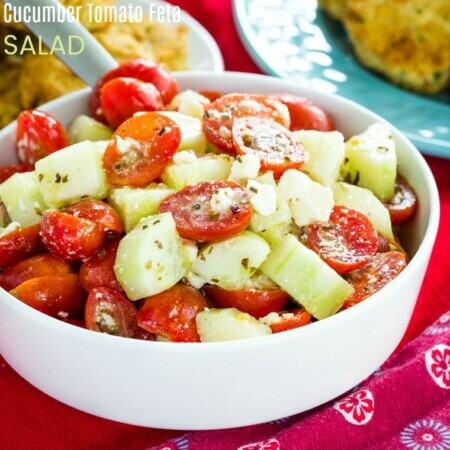 In a medium bowl, combine the ricotta cheese and cream cheese and beat with an electric mixer on medium until smooth. Add the honey and salt, and beat until well blended, then add the egg yolks, orange zest and orange juice, and beat until just combined. Pour the batter into the crust and bake for 45-50 minutes, or until the filing just barely jiggles when nudged. Cool to room temperature on a rack, then transfer to the refrigerator to chill until firm, about 2-3 hours. Prepare the Dark Chocolate Shell and pour over the cooled tart. Return to the refrigerator for at least an hour, until firm. Garnish with strips of orange zest, if desired. Combine the ingredients in a small bowl, and whisk until combined and smooth. Keep at room temperature until ready to pour over the tart. 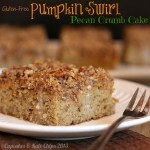 Looking for some more gluten free holiday baked goods? I love orange and chocolate together! 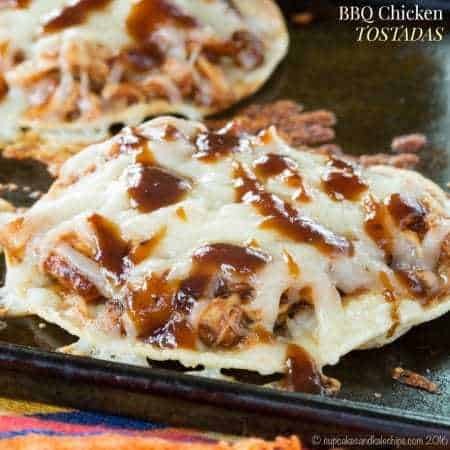 This looks like such a great recipe to bring to holiday parties, bookmarking it for sure! 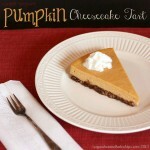 This sounds amazing, but I have no tart pan! :-/ Would a springform work ok? Love a Cake Boss and love to bake. I would make my daughter a beautiful Mickey/Minnie Mouse cake for her third birthday! I would make a chocolate cake. Thanks for the giveaway! I dont know what kind of cake yet, but it would be my daughters b-day cake for sure!! A red velvet cake for my birthday. your tart looks great! yum! Thanks for the chance to win! 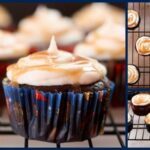 I love to bake but need better supplies! I am a big fan of the classic gingerbread… I would love to make this tart for mom mom’s birthday as something different since her birthday is three days before Christmas! The baking set would be perfect for when I move in with my future husband and start filling our first house!! I most definitely would make Christmas cookies first! I would make some star cookies. Something for the holidays, that’s for sure. Maybe Gingerbread Men or some chocolate cookie blossoms with candy cane kisses! I would make holiday cookies first!! This sounds and looks delicious. Pinned the receipe. This is the most gorgeous tart I’ve ever seen. Absolutely beautiful and just perfect for Christmas Week. I am so thrilled you joined us for this event Brianne. It’s been such a pleasure having you be part of the CW crew. It’s been so fun! Thanks for all of your hard work! I would make an epic birthday cake for my mum. 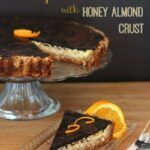 I would make Dark Chocolate Orange Ricotta Tart with Honey Almond Crust. Sounds so yummy! Truly one of the best desserts I’ve seen in a long time. I’m crazy for that dark chocolate orange combo and just might be tempted to add a splash of grand marnier to the mix!! Fabulous dessert! Oooh, love the Grand Marnier idea! Some fancy peanut butter and chocolate cakelettes! Mini cakes to use the Mini cake carrier! And then decorate some Christmas sugar cookies! I would make a 3 layer stacked cake. Decorate using the tips! Awesome! I would love to make a birthday cake and have fun decorating it with all the wonderful tools! I would love to make molded Christmas cookies – and decorate them! the Triple Orange Biscotti is what I’d probably try first as I love Biscotti’s with my coffee! I would make Christmas cookies. I love to cook so what couldn’t I make. I love to make cookies, pies, cakes, breads everything so I will continue to make items just on a better quality of bakeware! The first thing I’d make us some awesome banana bread in those mini loaf pans. Love peppermint chocolate combo! Also cranberry white chocolate. I’m going to make my grandmother a birthday cake! My daughter turns 40 in January and I would like to bake her a special cake to celebrate. Oh I will definitely make some mini breads… What a fun Cake Boss collection… Thanks !! I’d make a birthday cake for my baby brother first-with lots of chocolate! I would make some peppermint meringue cookies! I think my first quest would be the 3 tier cake. My kids would love it. this would definitely help jump start the baking process…i would make cookies (all kinds) for the holiday. I would make some gluten free Christmas cookies! 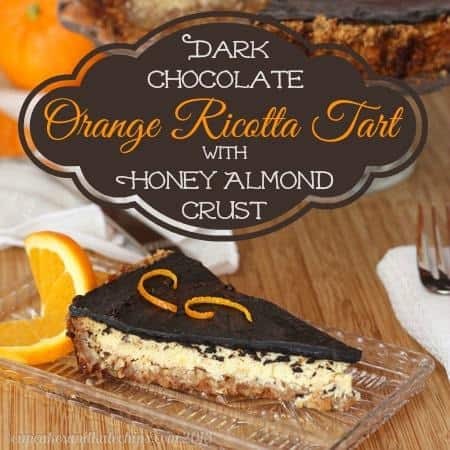 I don’t think I’ve ever seen anything like this before, but orange ricotta with a dark chocolate shell sounds really yummy! Thanks for joining us this week! We appreciate it…and I appreciate this beautiful tart! Yummy! I’m such a huge orange and chocolate fan! This looks great! Oh and my favorite holiday flavor combinations would have to be cranberry & white chocolate, and something with cinnamon sugar! I would be making some mini breads to give to parents and grandparents who live alone. I’d make lemon cupcakes in the Flower Cakelette pan. I would make a layered cake for a holiday party! I love the mini loaf pans! I’d make a variety of quick breads to give with other goodies. My birthday is coming up, I would make a very girly birthday cake with lots of pastel colors.